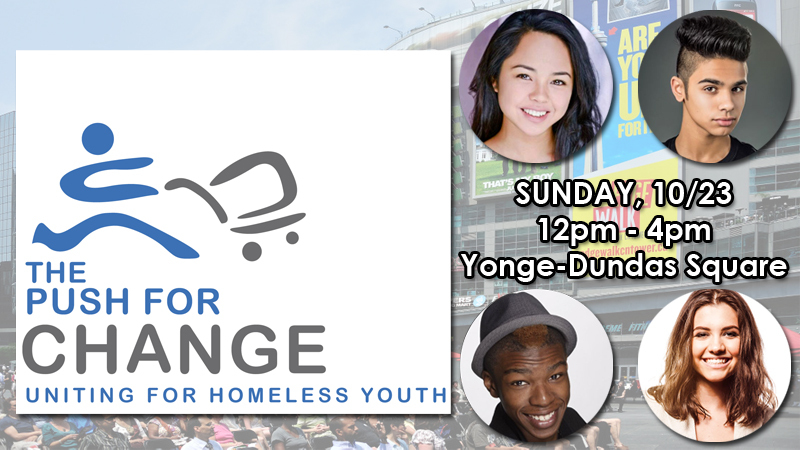 Chelsea Clark, Dante Scott, Richard Walters and Ana Golja will be attending The Push For Change event happening in Yonge-Dundas Square on Sunday, October 23. This awareness trek is led by Joe Roberts, a former homeless youth turned successful businessman, who’s pushing a shopping cart on foot across Canada to raise awareness about youth homelessness. When all is said and done, Roberts will have traveled over 9,000km (over 5,500 miles) through 10 provinces and 3 territories. The event will feature a “Walk With Joe” parade as Joe, Degrassi cast members and supporters lead a procession into Yonge-Dundas Square. It’ll also include live music and guest speakers. It’s free to the public, but if you want to be involved in the procession into the square they’re asking that you donate or fundraise $100.